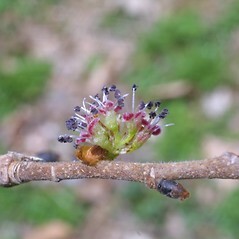 Ulmus rubra.Arthur Haines.New England Wild Flower Society.gobotany.new englandwild.org (Accessed 1/2015). Ulmus rubra is a tree to 20 m; 70 cm dbh; twigs rough, hairy, gray; buds dark, red-hairy, margins very dark, less than 0.3 cm long. Leaves alternate, stalk to 0.8 cm, blade 10-20 cm long, thick and stiff, very rough, scratchy above, hairy below. Flowers small, stigmas pink, sepals green and pink. March-April. 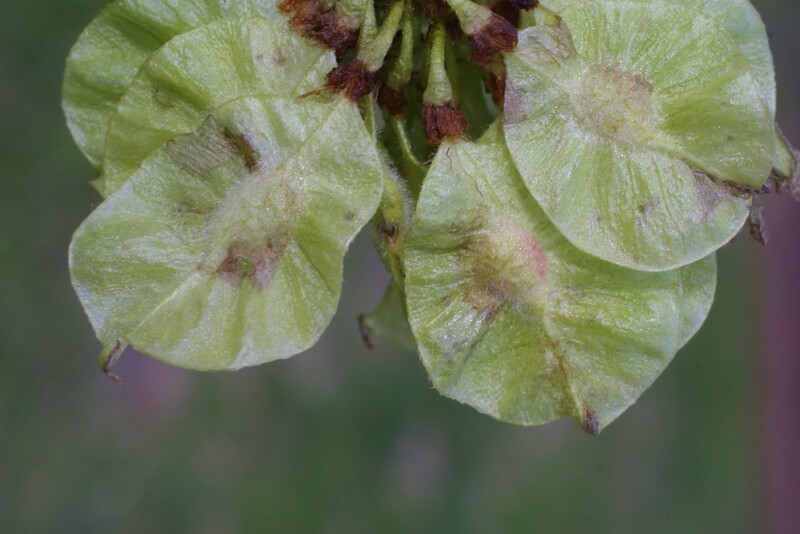 Fruit dry, flat, 1-seeded, winged, almost round, 1-2 cm, slight notch at base, finely reddish-hairy in center (Rehder 1986); wind dispersed, May-June. Seeds and buds eaten by birds and mammals (Martin et al. 1951). Seeds germinate soon after dispersal in full light or partial shade. Seedlings grow rapidly. Ulmus rubra bark Karren Wcisel© copyright 2010 TreeTopics treetopics.com (Accessed 3/2017). Habitat: regrown woodlands, flood plains, stream banks, soil pH 5-7.5 (USDA, NRCS 2010). Moderately shade tolerant (less so than Sugar maple). Intolerant of flooding for more than brief periods. 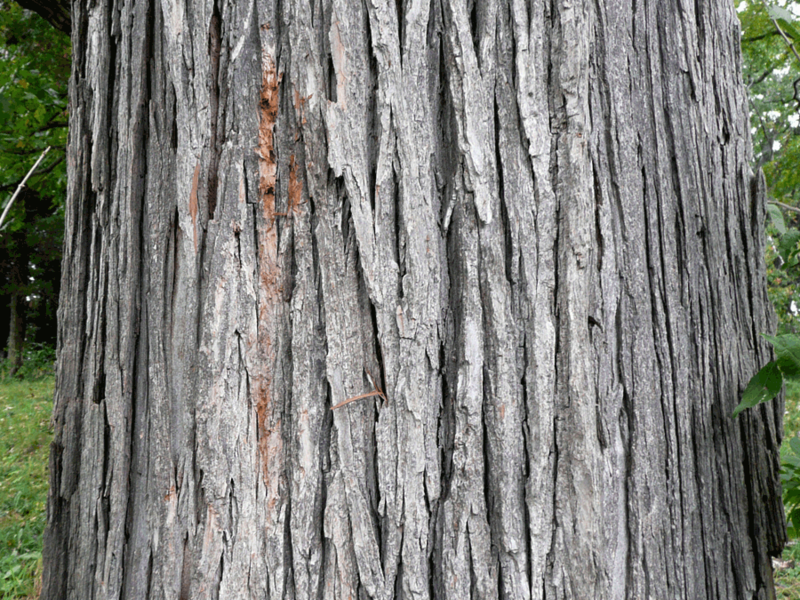 Ulmus rubra. fruit.By Steven Baskauf. Copyright © 2015 CC-BY-NC-SA.New England Wild Flower Society.gobotany.newenglandwild.org (Accessed 1/2015). Notes: Twigs eaten by rabbits (Martin et al. 1951). 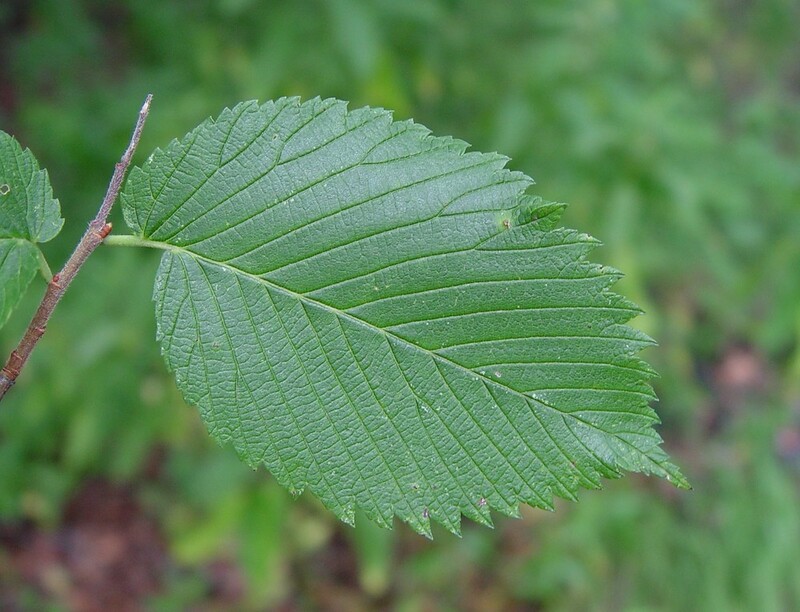 Susceptible to Dutch elm disease and elm yellows (see U. americana). In general it is attacked by the same fungi and insects that attack U. americana A host tree of the Asian longhorn beetle, Anoplophora glabripennis (see Norway maple, Acer platanoides).